By roncross | July 23, 2016 - 9:40 pm | December 12, 2016 Life, Love And Health. Soooo, I just got married! Yup, on July 9th, 2016 I married the love of my life, Sarah. We just got back from a wonderful honeymoon, and while we were there we posted lots of pictures and videos. All our friends knew we were in Austin so everyone was really surprised to see these amazing sunsets and lake views we were posting right from the balcony outside our room. So because several people expressed interest in also going there, I’ve decided to put this article together including all the details you need to know to book the same spot and have the same experiences you saw us posting on Facebook. And don’t worry if you’re not friends with either of us. I’m including several of the pictures and videos right here. So let’s go! How’d You Find This Place?? One thing this experience taught me is that the first thing you need to decide before you even get on line to start looking for a destination is what kind of activities you want to do. What kind of experience are you trying to have? That’s important to know because certain destinations are built around certain activities. I found places centered around golfing, other places designed for super-active athletic types where the activities included hiking and zip-lining, skiing, etc. Places like Vegas of course center around Gambling. For us we wanted a relaxing getaway experience. After all the planning and work involved in planning a wedding we just wanted to enjoy a nice drive to a beautiful place where we could exhale and relax. But we also wanted to be able to get out, walk around, do sight-seeing, etc. But I personally wanted to be somewhere where we’d have a beautiful view right from our hotel room. Preferably a view of a large body of water. So when I started searching I began looking for destinations like that within a 4 hour drive. I typed in terms like “hotels with great views”, hotels with water views, lake views, etc. Then I narrowed it down by searching for hotels within 4 hours that fit those terms. Those terms would often lead me to the hotel-booking sites, which I found to be a great place to view several hotels that fit what I wanted complete with reviews, prices and pictures. I eventually found Lakeway Resort And Spa on Hotels.com. Where In Austin Is Lakeway Resort Located? 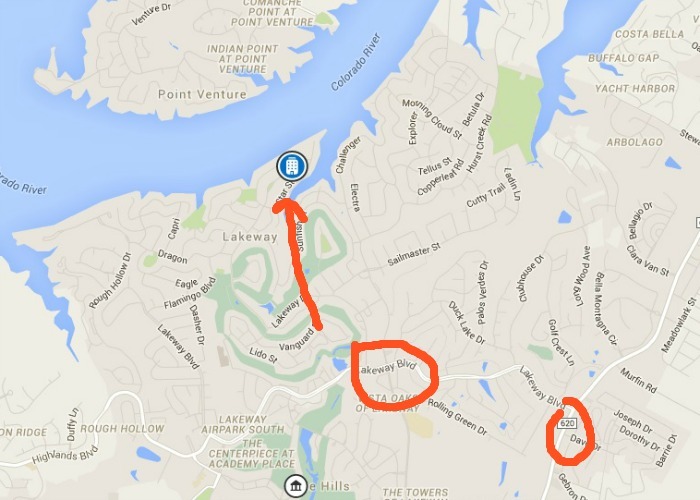 Technically Lakeway isn’t inside the Austin city limits. 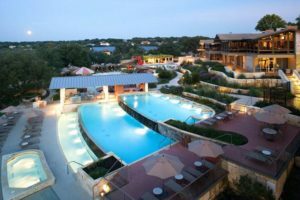 It’s located in a little town outside of Austin called “Lakeway, Tx.” The resort is about 40 minutes from downtown Austin, making it pretty easy to drive in for partying, live music, etc. Yet still far out enough to make you feel like you feel like you left the state. In fact often we felt like we’d left the country. Lakeway Resort is nestled right on the shores of Lake Travis. 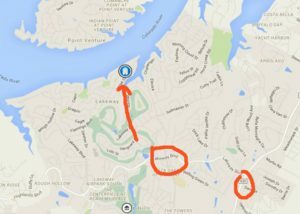 To get to it you have to drive through an exclusive neighborhood. But it’s a beautiful, relaxing ride down long, winding roads lined with beautiful homes. We saw deer walking around freely in the yards more than once. You’ll take that road all the way down to the lake, where the resort is located. From Dallas Tx we basically took I35 South to 620, 620 to Lakeway Dr then followed the neighborhood roads down to the resort. We encountered one toll road on the drive, but it’s automated with the camera billing. Which Room Do I Book To Get That View?? The one thing that made this trip so amazing for us- and the one thing that got the most questions and interest- is the amazing view we had from our balcony overlooking Lake Travis. But not all rooms at this resort have that view. In fact, not all of them that have the view even have the balcony. Lakeway Resort has several rooms. The town itself is located in what’s considered “Hill Country”. As such, one side of the hotel has rooms facing the hills and one side has rooms facing the lake. The rooms range from the standard sized rooms all the way up to large suites and even Condos. What size you want depends on how many of you will be staying together. Families may want to consider a suite. Large groups may want a condo. 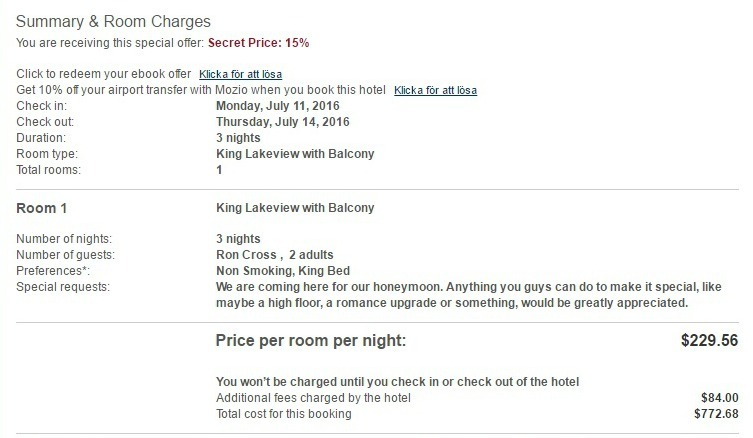 But if you’re going as a couple you’ll want to book the King Lake View With Balcony. This is the room we stayed in. As you’re comparing the room rates you’ll see that rooms with a hill view and rooms with a lake view but no balcony cost a little less. But in my opinion the King Lake View With Balcony is the cheapest room you should book at this hotel. It is absolutely worth every penny extra, and the price isn’t that different. 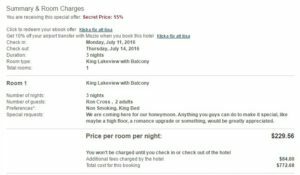 One thing I learned very quickly is that there are some fees included with most all hotel and resort bookings that they don’t show you in that price you see on the website. These are standard charges used universally across the entire hospitality industry, so there’s no need to be upset at any specific hotel for charging these fees. As you can see in the screenshot below the room we chose cost about $230. per night. But you also must pay hospitality tax. In our case this came up to about $84. NOT shown here though is an “incidentals” charge of $50 per night. Incidentals are things you might purchase or charge to your room during your stay. Things like room service or items from the hotel pantry or store, food items stocked in your room like snacks and alcohol, etc. 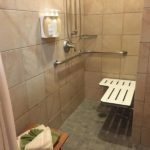 This $50 per night rate is charged to your card whether you use any of this stuff or not. If you do it comes off the charge. If you don’t the charges are credited back to your card. Just inside the lobby entrance to the right Lakeway Resort has a “pantry”. During our stay they were in the middle of even more renovations so all ice machines had been removed from the floors. We had to go to the pantry to get ice (it was free). But the pantry was fully stocked with all kinds of beer and wine, plus a wide assortment of snacks and non-alcoholic drinks like sodas. All told our total for 3 nights was $992. 68 including the incidentals, most of which we’ll get back. What Should We Do And What Should We Avoid? We didn’t do a LOT of stuff because we really wanted to leave feeling relaxed and refreshed. But there are 3 things we did that we loved so much we’d recommend them to everyone who visits Lakeway Resort. But there were a couple of things that both my own research and my contact suggested we should avoid, and we did. Let’s start with those first. Don’t Eat At The Resort! My research uncovered lots of great reviews about Lakeway Resort And Spa. However one thing that got mostly bad reviews was the restaurant at the resort. People universally felt that the food was NOT good and the prices were way too high for the quality of not only the food but the service. An insider at the resort confirmed it was true and recommended we avoid it, so we did. I also read many bad reviews about the food served via room service. People said it came up in cardboard boxes and was pretty bad. So we decided to do all of our eating away from the resort. We ordered pizza on the last night, but otherwise we ate at locations outside the resort. Don’t Buy Anything From The Pantry! As you might expect, the pantry, though very nicely appointed and very well stocked, is very expensive. My wife wanted a soda at one point and I thought I’d pick one up for her on an ice run. A 20 ounce bottle would cost me $4.00. So yeah, if you want any of your incidentals fees don’t shop down! There are many local restaurants and stores just a short drive outside the resort. Don’t Book A Hillside View Room! I saw one review on Yelp that said the hillside view isn’t really a view of the hillside at all, but a view of the parking lot. As we went in and out of the front lobby, sure enough we did see hotel rooms with balconies facing the parking lot. There may be some in other locations that have a better view of the hillside, but here’s my opinion. There’s no point coming to Lakeway Resort And Spa if you’re not going to have a view of the lake. If you want a view of the hills I’d suggest going to a hotel or resort that specializes in those views. You’ll get amazing views of the hill country with all the trees and rolling hills. Here though I really think you’re selling yourself short if you don’t splurge for the lake view. Don’t Go To 6th Street Or South Congress During The Week! One of the main attractions everyone kept telling us to be sure we experience was 6th street and South Congress in downtown Austin. It’s one of the city’s most famous attractions. You can park your car and just walk up and down the streets, both lined with many clubs and bars with great food and live music. But from what we could ascertain the people are the attraction and the thing that make it all worth seeing. Well, as we discovered the hard way, some things can only be properly experienced on certain days. 6th street and SOCO are both things you can only properly experience on the weekend when the crowds are there and all the clubs and bars are busy and hopping. We made the mistake of taking that drive down to 6th street on a Tuesday night. We saw about 6 people on 6th street, including US, lol!! It was pretty-much a ghost town. So yeah, unless you’re staying over the weekend it’s not worth it. Even if you’re there over the weekend though, make sure you understand the difference in the crowds you’re likely to find on 6th street vs the kind you’ll find on South Congress. Do Book Something At The Spa! One of the absolute highlights of our visit was a couples massage at the spa. This place is gorgeous and they create an atmosphere there that just takes your head somewhere else. From the time you walk in you hear this beautiful soft, relaxing new-age music playing everywhere you go. As you go into the different areas you see all these beautiful appointments, luxury accommodations and of course, it’s all wrapped in beautiful views of Lake Travis and the pool area, all visible through floor-to ceiling windows. 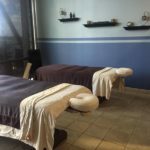 They have a very wide assortment of treatments aside from massages to choose from. We balked at the price at first, but we were so glad we did it afterwards. Whether you actually swim or even get in the water, the heated pool at Lakeway is another thing you should put on your must-do list. Located right outside the spa, the pool is just visually stunning. The adult area features a 3 level infinity pool with a swim-up bar at the top. It has lots of lounge chairs all around the deck with umbrellas to shield you from the sun. There’s also an attached sauna in the adult pool area. And of course the whole area has stunning views of Lake Travis. There is also a kids area next to the adult pool area. 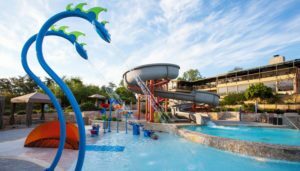 It’s fully equipped with slides, water features and everything kids enjoy. Visit The Oasis Lake Travis!! As I mentioned we ate off-site when we wanted a meal. 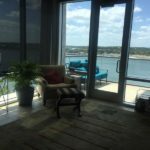 We visited a couple of restaurants, but by far the most amazing experience we had was when we visited The Oasis Lake Travis. This restaurant gets a lot of bad reviews on Yelp because people aren’t rating the whole experience. This is a tex-mex restaurant. The food isn’t amazing, 5-star stuff and that’s the biggest complaint people have. But when you compare one place to another place you have to compare apples to apples. People are giving this place a bad review because they’re rating only the food and comparing it to other more upscale restaurants that don’t have this view. But as evidenced by this video, you don’t go here simply for the food. This restaurant is about one thing, enjoying a meal while watching an amazing sunset over Lake Travis. Practically the whole thing is chiseled out of the side of a cliff, over 400 feet high over Lake Travis. Watching the sun drop behind those hills at the other side of the lake from a table on the side of a cliff is why people line up and wait 45 minutes EVERY night of the week to eat here. Honestly I’d say the food was on par with maybe an El Phoenix or something similar. But if you rate it only on the food you’re missing the point. Another big complaint was the price. Our bill for two was just under $40 not counting 2 margaritas we had while we waited. Those ran another $17. Not what I’d call terribly expensive. But you’re being naive if you expect this place not to charge a little more for the experience of having dinner jutting out of the side of a cliff, 400 feet above Lake Travis while counting down the last seconds of a beautiful sunset. With cheers and bell ringing and picture-taking at that! Go somewhere else for mind-blowing tex-mex while you look at ugly pictures and listen to annoying music. But in my opinion you can’t stay at this resort and not visit this restaurant. You do need to get there about an hour early though to get a good spot for the sunset. the exact time the sun will set is posted on their website every day. Be aware though, these people do not take reservations. I’m trying to make sure I give you guys details about everything we posted on Facebook about. Fore was the first restaurant we visited during our stay there. It’s only minutes away from the resort. Now, here’s where you go when you just want some great food. Fore is an upscale restaurant but the atmosphere there yields itself to everything from a romantic dinner to a family dinner and everything in between. We were there on a weeknight but they do often have live music on weekends. Believe it or not one of the most memorable things about our visit to Fore was the salad! We both ordered a Caesar salad, and all I can say is it was the best salad of any kind we’d ever eaten. It’s hard to describe beyond that. 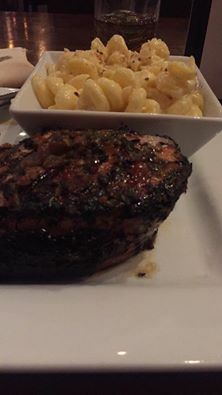 For the main course I had a 16 ounce pork loin with Macaroni and Cheese. It was very very good, but honestly just a tad dry. Sarah had Prime Rib with shrimp, which she raved about. The bill came out to around $100 with one drink each included. Very good food very close by, but just one of many restaurants I saw when I saw not far from the resort when I did a search. They have a nice video on their website. We’d definitely go back. As you can see we had an amazing time at Lakeway Resort And Spa. 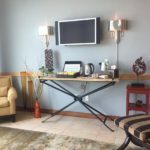 But I don’t think it would have been quite as wonderful if I hadn’t had a special contact at Lakeway helping me book everything and insuring our stay would be memorable. 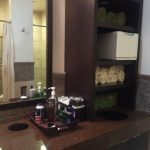 When I first started reading reviews about Lakeway Resort they were mostly positive. But I did notice several people giving negative reviews about the same thing; always a red flag for me. So I went to the resort’s fan page and sent them a private message expressing my concerns about these issues, sense I’d be coming there soon for my honeymoon. After several days without a response I sent another message expressing my frustration and plans to consider cancelling. The person who responded to that message was a lady named Cassie. But Cassie didn’t send me a reply on Facebook. She went the extra mile to visit my profile, find my number and call me personally. Cassie got on the phone with me and patiently explained every concern brought up in the reviews. She also went on to tell me how the hotel had addressed each of these issues and assured me they wouldn’t be a problem. From then on Cassie personally handled every aspect of my stay, from booking the rooms to help with extras like booking and scheduling our massages. Cassie was also instrumental in helping me find out about places like The Oasis and other attractions. Finally, it was Cassie who made sure we had the great room we were booked into, and it was she who blessed us with the romance upgrade you saw in the video. If you decide to book a visit to Lakeway Resort And Spa there’s no better way to do it than to contact Cassie Royael and let her personally help you the way she helped us. She literally became a “friend in the business” for us. I get nothing for telling you about her and connecting you with her other than the satisfaction of maybe getting her some extra recognition and attention from the management staff there at Lakeway. Tagged beautiful views, honeymoon spots, hotels, Lakeway Resort And Spa, near dallas tx, resorts, reviews, vacation spots, water views. Bookmark the permalink.